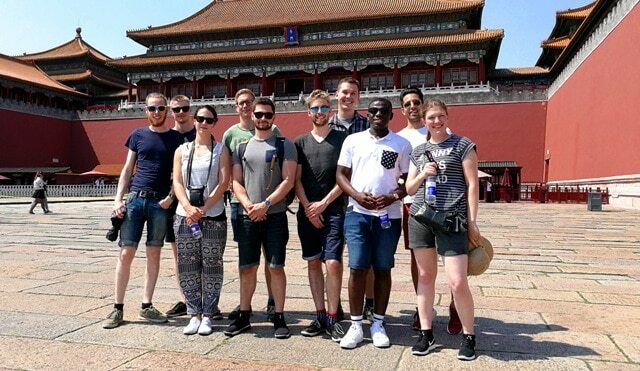 Gabriel Bampoe (3rd right) with other engineering students in the Forbidden City in Beijing while representing Denmark for Huawei´s flagship program in China. In July, Gabriel Bampoe, a Master Student under the BSU scholarship programme, got the opportunity to take a close look at the newest information and communications technologies in China. It all started when I was selected together with nine other engineering students from Aalborg Univeristy and Denmark’s Technical University to represent Denmark for Huawei’s flagship program for students all over the world ‘Seeds for the Future’, July 2 – 16, 2016. Sightseeing in and around Beijing started the two-week program and The Great Wall and Forbidden City were some of the amazing places we visited during the first weekend. The Beijing Language and Culture University hosted us for the first working week. This week also featured the opening ceremony for the program by Huawei’s Vice President. As the name suggests, Beijing Language and Culture University was all about getting to know basic Mandarin and some Chinese culture including calligraphy, painting, a Chinese game and a Chinese song. This was followed by certificates and a performance of songs in both Chinese and Danish. The next week was the more important to me and I really looked forward to it. We moved to the Huawei headquarters in Shenzhen where teaching and training on new technologies in the ICT was to be held. Like in Beijing, the weekend was allocated for sightseeing in Shenzhen which has a huge market for electronic products. Then serious business began! The training method was classroom teaching followed by practical work in the Huawei labs. The first course we were taught was about ‘Mobile Internet Application and Development Trends‘. Here, we learned about the Mobile Network structure and the distinction between how calls and data services are accessed on modern networks (e.g. LTE-A) and legacy networks. In groups of two we were able to set up our own call service and listen to each other. ‘Intelligent Network Application and Development Trends’ came next. With regards to this topic, the most important technology we looked at was optical networks and how they are used to provide Gigabit speed. In one of the practical sessions, a live streaming service was set up and accessed from different devices. As data is mostly virtualized in modern times, we were also given an overview of how a typical “Cloud Computing” service is. This was the final part of the technical work where we considered the cloud architecture and Huawei’s solutions to cloud. On the final day of training on technologies, we also had an opportunity for a guided tour of Huawei’s Exhibition Centers. On display, were a whole lot of devices and solutions offered by Huawei. Some of them included a typical ‘Smart Home’ set up and ‘Virtual Reality’ gaming. To end the program, a joint closing ceremony was held for the Danish delegation together with our colleagues from Australia, Portugal and Russia. Diplomas were presented to each of us to mark our completion of ‘The Seeds for The Future 2016’. All in all, I consider myself very fortunate to be part of this program which enlightened me very much in my field of study. Furthermore, it opened my eyes to a whole new culture and gave me the opportunity to network with the wonderful Danish group as well as colleagues from other countries. I came back from the ‘Seeds for the Future’ programme very ‘charged up’ to take up new challenges in the fast growing ICT environment with the numerous opportunities it presents on the global scene. To Huawei, I say “XieXie!” for this wonderful experience. To Danida and the Danish government, a big “TAK!” for giving me the opportunity to study in your lovely country which continues to bring out the potential in me! Gabriel Bampoe is a master student (BSU) from Ghana. He studies Master of Science at Aalborg University. Huawei is a leading global information and communications technology (ICT) solutions provider. Huawei is a Chinese company and has an ICT portfolio of end-to-end solutions in telecom and enterprise networks, devices, and cloud computing. The ICT solutions, products, and services are used in more than 170 countries and regions, serving over one-third of the world’s population. Huawei has 170,000 employees.